The Blue Ridge Parkway is a National Parkway and All-American Road in the United States, noted for its scenic beauty. The parkway, which is America's longest linear park,  runs for 469 miles (755 km) through 29 Virginia and North Carolina counties, linking Shenandoah National Park to Great Smoky Mountains National Park. It runs mostly along the spine of the Blue Ridge, a major mountain chain that is part of the Appalachian Mountains. Its southern terminus is at U.S. 441 on the boundary between Great Smoky Mountains National Park and the Cherokee Indian Reservation in North Carolina, from which it travels north to Shenandoah National Park in Virginia. The roadway continues through Shenandoah as Skyline Drive, a similar scenic road which is managed by a different National Park Service unit. Both Skyline Drive and the Virginia portion of the Blue Ridge Parkway are part of Virginia State Route 48, though this designation is not signed. Begun during the administration of President Franklin D. Roosevelt, the project was originally called the Appalachian Scenic Highway. Most construction was carried out by private contractors under federal contracts under an authorization by Harold L. Ickes in his role as federal public works administrator. Work began on September 11, 1935, near Cumberland Knob in North Carolina; construction in Virginia began the following February. On June 30, 1936, Congress formally authorized the project as the Blue Ridge Parkway and placed it under the jurisdiction of the National Park Service. Some work was carried out by various New Deal public works agencies. The Works Progress Administration did some roadway construction. Crews from the Emergency Relief Administration carried out landscape work and development of parkway recreation areas. Personnel from four Civilian Conservation Corps camps worked on roadside cleanup, roadside plantings, grading slopes, and improving adjacent fields and forest lands. During World War II, the CCC crews were replaced by conscientious objectors in the Civilian Public Service program. The Eastern Band of Cherokee Indians were also affected by the parkway, which was built through their lands. From 1935 to 1940, they resisted giving up the right-of-way through the Qualla Boundary, and they were successful in gaining more favorable terms from the U.S. government. Specifically, the revised bill "specified the parkway route, assured the $40,000 payment for the tribe's land, and required the state to build [a] regular highway through the Soco Valley". (The highway referred to is part of U.S. Route 19.) Cherokee leaders participated in the dedications when the Cherokee sections opened in the 1950s. Construction of the parkway was complete by the end of 1966 with one notable exception. The 7.7-mile (12.4 km) stretch including the Linn Cove Viaduct around Grandfather Mountain did not open until 1987. The project took over 52 years to complete. Flowering shrubs and wildflowers dominate the parkway in the spring, including rhododendrons and dogwoods, moving from valleys to mountains as the cold weather retreats. Smaller annuals and perennials such as the daisy and aster flower through the summer. Brilliant autumn foliage occurs later in September on the mountaintops, descending to the valleys by later in October. Often in early-to-middle October and middle to late April, all three seasons can be seen simply by looking down from the cold and windy parkway to the green and warm valleys below. October is especially dramatic, as the colored leaves stand out boldly and occur mostly at the same time, unlike the flowers. Major trees include oak, hickory, and tulip tree at lower elevations and buckeye and ash in the middle, turning into conifers such as fir and spruce at the highest elevations on the parkway. Trees near ridges, peaks, and passes (often called gaps or notches) are often distorted and even contorted by the wind, and persistent rime ice is deposited by passing clouds in the winter. The Blue Ridge Parkway tunnels were constructed through the rock—one in Virginia and 25 in North Carolina. Sections of the parkway near the tunnels are often closed in winter. Because groundwater drips from above with freezing temperatures and a lack of sunlight, ice often accumulates inside these locations despite above-freezing temperatures in the surrounding areas. The highest point on the parkway (south of Waynesville, near Mount Pisgah in North Carolina) is 6,053 feet (1,845 m) above sea level on Richland Balsam at milepost 431 and is often closed from November to April because of inclement weather such as snow, fog, and even freezing fog from low clouds. The parkway is carried across streams, railway ravines and cross roads by 168 bridges and six viaducts. The parkway runs from the southern terminus of Shenandoah National Park's Skyline Drive in Virginia at Rockfish Gap to U.S. Route 441 (US 441) at Oconaluftee in the Great Smoky Mountains National Park near Cherokee, North Carolina. There is no fee for using the parkway; however, commercial vehicles are prohibited without approval from the Park Service Headquarters, near Asheville, North Carolina. The roadway is not maintained in the winter, and sections which pass over especially high elevations and through tunnels are often impassable and therefore closed from late fall through early spring. Weather is extremely variable in the mountains, so conditions and closures often change rapidly. The speed limit is never higher than 45 mph (72 km/h) and lower in some sections. Mile 0 Rockfish Gap near Waynesboro, Virginia, is the northern end of the Blue Ridge Parkway. To the north the parkway connects directly to Skyline Drive, which winds 105 miles (169 km) through Shenandoah National Park. 5 to 9.3 Humpback Rock has a self-guiding trail through a collection of old Appalachian farm buildings. A hiking trail from the parking area (at mile 6.1) leads 0.75 miles (1.21 km) to The Rocks, whose humped appearance gives the area its name. Greenstone self-guiding trail (8.8). 10.7 Ravens Roost offers vistas of Torry Mountain and the Shenandoah Valley to the west. The overlook is built above a cliff, so it is frequently used for rock climbing and hang gliding. There is also a single picnic table. 16 Sherando Lake is a recreation area in George Washington National Forest 4.5 miles (7.2 km) from the parkway via VA 814. Swimming, picnicking, and camping. 29 Whetstone Ridge provided many a mountain man with a fine-grained sharpening stone. 34.4 Yankee Horse Ridge supposedly is where a hard-riding Union soldier's horse fell and had to be shot. A reconstructed spur of an old logging railroad provides access to Wigwam Falls. 58 to 63.6 Otter Creek runs 10 miles (16 km) down the Blue Ridge to the James River. Otter Lake (63.1), fishing, trail. 63.8 The James River and Kanawha Canal is where a footbridge leads across the river to the restored canal locks and exhibits. A self-guiding trail follows the river bluff. 71 Onion Mountain's short loop trail leads through rhododendron and mountain laurel. 83.4 Fallingwater Cascades can be seen along a 1.6-mile (2.6 km) loop trail. 84 to 87 Peaks of Otter are three mountain peaks which have been popular viewing sites since the days of Thomas Jefferson. A shuttle bus provides service to Sharp Top. 114.9 The Roanoke River Gorge is visible after a short walk. 120.4 Roanoke Mountain is a 3.7-mile (6.0 km) side trip. A one-way loop road, with steep grades, crosses over the mountain. Towed vehicles are prohibited. 129.6 Roanoke Valley Overlook gives a view of the largest city along the parkway. 154.5 Smart View is named for having "a right smart view". A nearby cabin built in the 1890s is known as a spot for viewing dogwood blooms in early May. 167 to 174 Rocky Knob overlooks Rock Castle Gorge. 176.1 Mabry Mill was operated by E.B. Mabry from 1910 to 1935. A trail leads to his gristmill, sawmill, blacksmith shop, and other exhibits. Old-time skills are demonstrated in the summer and fall. 188.8 Groundhog Mountain has a variety of rural fences: snake, Post-and-rail, picket and buck. Picnic grounds and observation tower are also nearby. 189.9 Aunt Orelena Puckett Cabin Exhibit was the home of an area midwife. 213 Blue Ridge Music Center near the town of Galax with concerts, music demonstrations, and a 17,000-square-foot (1,600 m2) museum dedicated to anything musical, especially old-time music. The Blue Ridge Parkway crosses the North Carolina– Virginia state line at mile 216.9. The 1749 party that surveyed the boundary included Peter Jefferson, father of Thomas Jefferson. Mile 217.5 Cumberland Knob, at 2,885 feet (879 m), is the centerpiece of a small parkway recreation area. 218.6 Fox Hunters Paradise, down a short walking path, is where hunters could listen to their hounds baying in the valley below. 238.5 Brinegar Cabin was built by Martin Brinegar about 1880 and lived in until the 1930s when the homestead was purchased from his widow for the parkway. The original cabin stands there today. 238.5 to 244.7 Doughton Park was named for Congressman Robert L. Doughton, a staunch supporter and neighbor of the parkway. The park has many miles of hiking trails, a lodge, dinner, picnic area and a campground. 258.6 Northwest Trading Post offers crafts from North Carolina's northwestern counties. 260.6 Jumpinoff Rock is at the end of a short woodland trail. 264.4 The Lump is a grassy knob that provides views of the forested foothills. 272 E. B. Jeffress Park has a self-guided trail to a waterfall known as the Cascades. Another trail goes to an old cabin and church. 285.1 Daniel Boone's Trace, which Boone blazed to the West, crosses near here. 292 to 295 Moses H. Cone Memorial Park has hiking, fishing and horse trails. Flat Top Manor, the former house of Moses H. Cone, is now used as the Parkway Craft Center. 295.1 to 298 Julian Price Memorial Park, the former retreat of the insurance executive Julian Price, offers a variety of hiking trails, campground, and 47-acre (190,000 m2) Price Lake. This is the only lake on the parkway on which paddling is allowed. 304.4 Linn Cove Viaduct, the last segment of the parkway built, skirts the side of Grandfather Mountain. A visitor center is located nearby and provides access to a trail under the viaduct. 308.3 Flat Rock provides views of Grandfather Mountain and Linville Valley. 316.3 Linville Falls Recreation Area provides trails with overlooks of Linville Falls and the Linville Gorge. A campground and picnic area are also provided. 331 The Museum of North Carolina Minerals interprets the state's mineral wealth. 339.5 Crabtree Meadows & Crabtree Falls is a parkway recreation area with a picnic area, campground, giftshop and hiking trails. 349.2 Laurel Knob provides views of Grandfather Mountain, Linville Mountain, Hawksbill Mountain, and Table Rock. 355.4 Mount Mitchell State Park, reached via NC 128, is the highest point east of the Mississippi River. 359.8 Walker Knob, formerly known as Balsam Gap, is located where the Black Mountains and the Great Craggy Mountains meet. 361.2 Glassmine Falls is an 800-foot (240 m) ephemeral waterfall visible from an overlook on the side of the parkway. 363.4 to 369.6 Craggy Gardens in the Great Craggy Mountains are covered with purple rhododendron in mid-to-late June. Craggy Pinnacle Trail and other trails (364.1 and 364.6); road to picnic area and trails (367.6). 382 The Folk Art Center is the flagship facility of the Southern Highland Craft Guild. It offers sales and exhibits of traditional and contemporary crafts of the Appalachian region. There are interpretive programs, three galleries, a library and a book store. 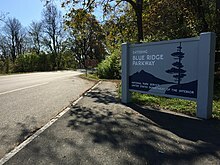 384 The Blue Ridge Parkway Visitor Center is the newest along the parkway. Exhibits focus on the history and heritage of the parkway and western North Carolina. 408.6 Mount Pisgah was part of the Biltmore Estate. The estate became home of the first forestry school in America and the nucleus of the Pisgah National Forest. Also located here is the Pisgah Inn resort, a park service concession. 417 Looking Glass Rock is visible from many spots on the parkway starting at Mount Pisgah. 418 East Fork Overlook. Located here are the headwaters of the Pigeon River. Yellowstone Falls is a short distance away and gets its name from the yellowish moss covering the rocks. 420.2 Shining Rock Wilderness is the largest wilderness area in North Carolina, covering 18,483 acres (74.80 km2), with 25 miles (40 km) of trails and peaks over 6,000 ft (1,800 m). The wilderness is named for Shining Rock. 420.2 Black Balsam Knob is a grassy bald with panoramic views just outside the Shining Rock Wilderness in Pisgah National Forest. The wilderness area also includes Cold Mountain. 422.4 Devil's Courthouse is a rugged exposed mountaintop rich in Cherokee traditions. 423.5 Herrin Knob Overlook. A hiking trail goes around Tanasee Bald and Herrin Knob. Tanasee Bald (423.7) is said to be the home of the mythical Cherokee giant Tsul 'Kalu. 431 Richland Balsam is the highest point on the parkway at 6,053 feet (1,845 m). There is a self-guiding trail that passes through a remnant spruce- fir forest. 435.7 Licklog Ridge once hosted cattlemen and their herds of cattle before it became part of the national forest. The area earns its name from the cattlemen who would place rocks of salt into logs and holes in the earth. 451.2 Waterrock Knob provides a panorama of the Great Smokies, visitor center, trail, comfort station, exhibits. 458.2 Heintooga Ridge Road runs north from the parkway 8.8 miles (14.2 km) to Heintooga Overlook in Great Smoky Mountains National Park. Mile 469 The southern end of the Blue Ridge Parkway intersects with U.S. 441 in Great Smoky Mountains National Park and the Cherokee Reservation near Cherokee, North Carolina. It is not unusual for small sections of the parkway to be temporarily closed to repair damage caused by the cold winter climate of the mountains or for other maintenance. Detours caused by these closures are well marked and are arranged to cause as little disruption as possible, though maintenance such as repaving only warrants a stop/slow switch with a one-lane-only restriction. Due to serious damage in 2004 from Hurricane Frances, then again by Hurricane Ivan, many areas along the parkway were closed until the spring of 2005, with two areas that were not fully repaired until the spring of 2006. 286.0 US 58 (via US 58 Bus.) – Stuart, Hillsville Parkway and US 58 grade-separated; two-quadrant interchange with US 58 Bus. ^ Though current plans for I-73 take it along current US 220 at its parkway interchange. ^ "Blue Ridge Parkway". National Park Service. Retrieved July 18, 2014. ^ "NPS Annual Recreation Visits Report". National Park Service. Retrieved February 14, 2019. ^ "Blue Ridge Parkway". The Cultural Landscape Foundation. ^ "National Park Service Visitor Use Statistics". Retrieved April 19, 2013. ^ "America the Beautiful Quarters". U.S. Mint. Retrieved September 6, 2010. ^ a b c Chesto, Shawna (Summer 2007). "The Effect of the Blue Ridge Parkway on Appalachian Farmers". Appalachian State University. Retrieved April 19, 2015. ^ a b c Mitchell, Anne V. (Winter 1997). "Culture, History, and Development on the Qualla Boundary". Appalachian Journal. 24 (2): 144–191. JSTOR 40933835. ^ Brown, Jeff (January 2015). "Road with a View: Blue Ridge Parkway". Civil Engineering Magazine. American Society of Civil Engineers: 42–45. Retrieved January 4, 2016. ^ Mitchell, Monte (September 11, 2012). "25-Year-Old Linn Cove Viaduct Floats Around Grandfather Mountain". Winston-Salem Journal. Archived from the original on January 26, 2013. Retrieved October 9, 2012. ^ Whisnant, Anne M. (2006). Super-Scenic Motorway: A Blue Ridge Parkway History. Chapel Hill: University of North Carolina Press. pp. 45–46 – via Google Books. ^ "§5.6 Commercial vehicles". Code of Federal Regulations. ^ National Park Service (2004). Blue Ridge Parkway: North Carolina, Virginia (Map). [c. 1:500,000]. Washington, DC: Government Printing Office. OCLC 86108275. GPO:2003-496-196/40572 Reprint 2004. ^ Digital Confections LLC (February 2016). Blue Ridge Companion. iOS. Carter, Mark W.; Southworth, Scott; Tollo, Richard P.; Merschat, Arthur J.; Wagner, Sara; Lazor, Ava; Aleinikoff, John N. (2017). "Geology Along the Blue Ridge Parkway in Virginia". In Bailey, Christopher M.; Jaye, Shelley (eds.). From the Blue Ridge to the Beach: Geological Field Excursions Across Virginia. Field Guide. Vol. 47. Bolder, CO: Geological Society of America. pp. 1–58. doi: 10.1130/2017.0047(01). ISBN 978-0-8137-0047-2. ISSN 2333-0945. OCLC 7345022117. Hall, Karen J.; Friends of the Blue Ridge Parkway (2007). Building the Blue Ridge Parkway. Images of America. Arcadia Publishing. ISBN 0738552879. United States House of Representatives Committee on Public Lands (n.d.). Establishing the Blue Ridge Parkway in North Carolina: Hearings Before the Committee on the Public Lands. Washington, DC: United States House of Representatives. OCLC 71073462. Whisnant, Anne Mitchell (2006). Super-Scenic Motorway: A Blue Ridge Parkway History. University of North Carolina Press. ISBN 978-0-8078-7126-3. Wikimedia Commons has media related to Blue Ridge Parkway. Wikivoyage has a travel guide for Blue Ridge Parkway.